If you love modern or vintage hankies, it can be fun to create beautiful home décor and apparel items with handkerchief craft projects. Before the invention of disposable tissues, most people carried handkerchiefs in their pockets or purses. These small cloth squares were used to wipe up spills, clean children's faces, and wipe noses. Many hankies, especially those made for ladies, were also considered personal style statements. They often featured beautiful lace, delicate embroidery, and luxury fabrics. Today, you can buy these vintage handkerchiefs in antique stores or find them at garage sales and flea markets. These days, it's also popular to carry a handkerchief for a special event, such as a wedding or graduation. 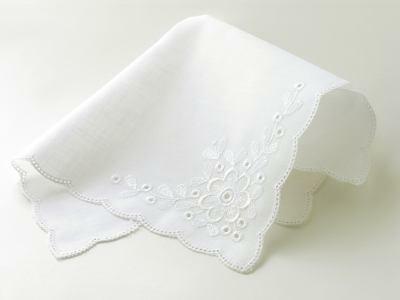 Many of these special handkerchiefs feature embroidered monograms, names, and dates. Some people also choose to carry modern handkerchiefs as a frugal and environmentally responsible alternative to disposable tissues. Whether you want to create something special from your grandmother's antique linen handkerchief or you have a few extra modern hankies on hand, handkerchief crafts can be fun and easy. If you have a special vintage handkerchief that you'd like to display as a home décor focal piece, you can create a beautiful throw pillow. This craft provides a backing for the handkerchief, which can be helpful if the piece is somewhat fragile. However, stay away from torn or fraying handkerchiefs, since they may not hold up to the rigors of everyday life in your living room. Look at the pillow form package to determine the measurements for your pillow. Add two inches to each dimension, and cut your fabric to these measurements. You'll have two square or rectangular pieces of fabric. On one of the fabric pieces, use pins to secure the handkerchief in the way you'd like to display it. You could center the handkerchief on the pillow, or you might choose to angle it for greater impact. Hand sew the handkerchief into place. Arrange your pillow fabric with the right sides together, using pins to secure the seams. Machine sew three sides of the pillow, and turn the case right side out. Slip the pillow form into the case. Hand sew the fourth side to close it. Bandanas are modern handkerchiefs with bold, paisley prints. You can find them at most discount stores, and they are very affordable. You'll need several for this handkerchief craft, which is perfect for a novice seamstress. Fold each bandana once diagonally to create a triangle shape. Find the center of the folded side, and use a pin to secure the bandana to the hem of the jean skirt. Hand sew the bandana onto the jean skirt. When it is tightly attached, sew on a button to cover your stitches. Repeat with the remaining bandanas until the entire hem is covered. If you or someone you know has a special wedding handkerchief, it can be fun to make the hanky into a baby bonnet. This project doesn't require any cutting, so you can actually take the bonnet apart to use it as a handkerchief again someday. Use your iron to press any creases out of the handkerchief. It's very important that the hanky be flat in order to make a bonnet that looks good. Fold one side of edge of the handkerchief over about an inch and a half. Press the fold with the iron. Use the needle and thread to take large stitches along this folded edge. Instead of tying off the thread at the end, gently pull thread to gather the fabric into a rough bonnet shape. Take a few stitches to secure the two ends of the gathered edge. Fold the straight edge of the hanky back until it is the correct size for a bonnet. The amount you fold back will depend on the size of the hanky you are using. Press this fold. Sew ribbons to the front part of the bonnet to create the ties. If you have a vintage hanky that is too fragile to use for sewing crafts, you can create a display in a shadow box. This can also be a fun handkerchief craft for special wedding or graduation hankies. Open the shadow box and remove the backing. Cut the scrapbook paper to fit, then use the adhesive tabs to apply the scrapbook paper to the backing. Use photo corners to stick the photo on the backing. Fold the handkerchief to best display any embroidery. Use a poster pin to secure it to the back of the shadow box. Set other special items on the bottom of the shadow box frame, and reattach the back. Turn a hanky into a doll skirt. Include a special handkerchief in a scrapbook album. Make a quilt with handkerchiefs sewn together. Use vintage hankies to trim a window valanence. Attach a folded handkerchief to the front of store-bought apron to make a fun pocket. Make a baby bib out of a sturdy hanky. Attach a hanky to the front of a handmade card. No matter which handkerchief craft you choose to make, you'll be inspired by the delicate needlework and fun designs of these tiny fabric treasures.